Brian Finch is one of those folks that does it all — and does it well, too. 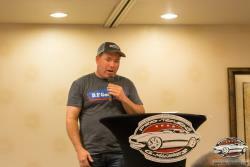 He's won autocross and road races as well as the Baja 1000. Oh and he’s also a TV personality and a pro car builder. His latest project? 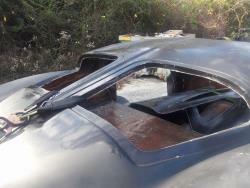 A 1963 Split Window Corvette — light weight and all business. Well maybe not all business! Finch has been a team driver for Spectre for 3 years but a loyal brand enthusiast for close to seven years. Spectre is a Brand that has been behind the Pro-Touring movement from the start. They have supported racers and most importantly events that let drivers like Brian go out and enjoy their cars. Brian says that being selected to represent the brand is something he is very proud of and also something to not take lightly. Having the responsibility and honor of flying the Spectre flag helps keep him focused and drives him to keep reinventing what and how he does things; reminded of how easy it can be to get a sponsor, but much harder to keep them year over year. 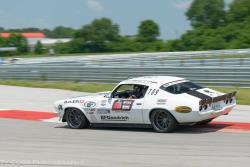 His very first ever Goodguys Autocross was at the First Annual Nashville Goodguys show. He took his 1971 Camaro, which at the time was a Pro-Street Build with a blown 454 and 6 speed and had it in the Home Built Heaven corral. He heard the tire squealing and saw the tire smoke from the autocross so he walked over to check it out on Friday afternoon. It looked like a blast but he was way too nervous about making a fool of himself since he’d never done anything like that before. Fast forward to Saturday afternoon where he finally worked up enough nerve to go try it. He remembered that he could barely keep the car pointed straight due to the lack of grip with all the power it was making. The one thing he did know was that he liked it and had to have more. So he kept jumping back in line to run over and over again. He started getting a little faster with each run as he learned to tame the beast and in the last hour of the event made that glory pass that put him ahead of the G-Force Cuda of Bob Johnson for the event win. From there he exploded onto the scene and started converting the pro-street car to pro-touring and the rest is history. Bottom line it was just getting off the fence and making that first pass that started him down the path of a racing career. 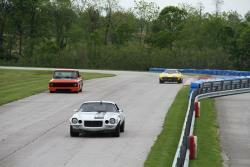 NSRA Springfield, Fastest Autocross time of the event. 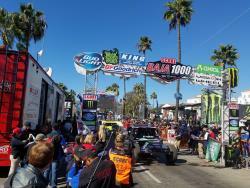 At this year’s Baja 1000 race, BFGoodrich had 2 team vehicles entered. Brian and his team were tasked with using the race to test a new tire that will be launching in 2018. Before BFG can stamp Baja Champion on the tire they first must win the race on that tire and having 2 BFG cars in the class of 11 entries increased those odds. The team mission was a 1-2 finish and that is exactly what they delivered. It was not without challenges, but they were not mechanical nor course related issues. Sadly they were plagued with over half of the two BFG race teams coming down with a very bad intestinal virus the morning of the race. Several drivers had to exit the car early, stop to expel fluids on the side of the race course or even not get into the vehicle at all. This required some quick adjustments to the driver assignments but in the end they made it through. Both teams were neck and neck up to the last pit stop when Brian’s team found a torn CV boot on his car that had to be changed. The 45 min swap took he and his team out of contention for the win, but they had enough of a gap over the 3rd place car to stay in 2nd place. Brian was driving the last leg of the race this year so he enjoyed that great moment of crossing the finish line. 2017 looks to be another growth year for Brian on many levels. His event promotion company, Autocrossguys.com, has 10 events on the calendar for 2017 with 5 of them coming from a new NSRA partnership. His parts line, Finch Performance, is growing and making the move to Summit Racing for distribution. Finch Performance is also in the development stage on their first line of suspension products for the C5, C6, and C7 Corvettes, starting with a full tubular control arm swap kit. Finch is well underway on the build of a 1967 Ford Mustang that Spectre Performance is collaborating on, which will be making its debut at the 2017 SEMA show. The suspension is complete, body mods are at 90% and now they are working with Precision Turbo on the fun part of the build and in his words, should be slinging mud soon. 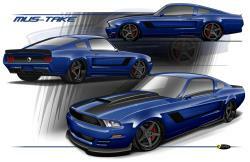 Brian, no stranger to competition, will showcase this 1967 “Mustake” in the SEMA Battle of the Builders® competition. 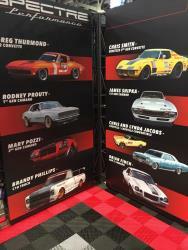 Now in its fourth year, this competition, open only to vehicles displayed at the SEMA Show, features the best builders in the country who come to SEMA in seek of the coveted title of ultimate builder. The Baja 1000 and off road desert racing in general has quickly become his favorite type racing. Kyle Tucker, of Detroit Speed and Engineering, and Brian are in the throes of building a trophy truck team to compete in the 50th running of the Baja 1000 with BFGoodrich which will be a major bucket list item for them both. “The race is not just about who can go fast but is about who can go fast and get the car a thousand miles to the finish line”, said Brian. Brian will continue this year with his on track “Share the Ride” program that he started with his American Street Car events and with the BFG “Are You Driver Enough” tour that allows for their dealers to come and experience the new product offerings. As one of the programs lead spokespersons, Brian provides instruction both in the classroom and on the track offering the driver an opportunity to safely drive as hard as they want to!